We want to make art collecting fun....and easy! The topics below should answer many of your questions. If you have other queries, email art@galleryone.com. To view PDF images, you must have Adobe® Reader® software. How important are certificates of authenticity? Throughout our website, you may find several PDF files for you to view, which you have to download to view. PDF is short for Portable Document Format, a file format developed by Adobe Systems which captures formatting information from a variety of desktop publishing applications, making it possible to send formatted documents and have them appear on the recipient's monitor or printer as they were intended. To view a file in PDF format, you need Adobe Reader, a free application distributed by Adobe Systems. Click on the Adobe logo for a free download. Most collectors understand and feel knowledgeable when speaking of singular original works of art — paintings, pencil drawings, pen and inks, acrylics, watercolors, etc. Here the artist has created ONE work of art with his own hand. The surface might be paper or canvas or even masonite. A bit more complicated are MULTIPLE ORIGINALS....commonly called ORIGINAL PRINTS. Traditionally, the artist creates a master image for the purpose of making a small number of prints that he will sign and number. The master image might be created upon a block, stone, plate or screen — any of which assists in conveying the image to the print surface. The blocks, plates, stones and screens cannot be considered originals. They are just vehicles to produce ORIGINAL PRINTS. Next there are REPRODUCTIVE PRINTS. The artist has produced an original work...and photograph technology and automated printing equipment create reproductions. Fine art print reproductions are usually signed and numbered in limited editions and care must be exercised so they remain in mint condition in order to preserve their value. A similar, but much advanced process, creates giclées — the state of the art prints now taking the art collecting world to a whole new level. Art collectors have long had the choice of purchasing art on paper or art on canvas. The paper art included original works such as watercolors, pastels, pencil or ink drawings, lithos, serigraphs and etchings....and limited editions reproduced photomechanically from originals. Canvases were usually original (and costly) works of art. But now, the growing popularity and availability of limited editions on canvas give collectors “the original look” at affordable prices. So what are limited edition canvases and how are they produced? There are several ways of producing canvas limited editions such as the once popular “canvas transfers,” made by fusing the top layer of a paper print onto a prepared canvas surface. The result was an image that appeared as you might expect it to — like a paper print fused to a piece of canvas. Often, to make the print look “original,” the artist (or a technician) added textured varnish or paint to the print surface. Today's state of the art reproductive technique is the giclée(jhee-clay) method in which high-tech printing equipment sprays millions of digitally-matched ink droplets per second onto a surface. Canvas, paper and archival board are the most common giclée surfaces. Developed some ten years ago, the giclée has now become the “gold standard” — an important and permanent part of the limited edition world. This spectacular blend of technology and fine art looks so much like the original work of art that even astute collectors do “double-takes.” Therefore, buyers should be aware that not all “original appearing” works of art are original. The giclée (unless printed on paper) is meant to be enjoyed without glass, so nothing comes between you and your art. Buy what you like . . . what you really, really like! And you’ll enjoy your selections more with each passing year. Color selection is easy if you relax and listen to the palette “in your head.” It’s the same palette that was at work when you selected your room decor. If you are on a budget, it is better to buy one sizeable quality item than to purchase a bunch of smaller and cheaper ones. First, select art for the areas that are the most noticeably bare. Remember that art work is portable. Unlike paneling and wallpaper, you can take it with you when you move. And speaking of art being portable, rarely should art be hung with anything other than standard picture hooks. And rarely is it necessary to nail into a stud. With standard picture hooks hung into drywall, for example, art work can be easily moved and old nail holes patched in a jiffy. Framing should be chosen to match and enhance the individual work of art. Then if you move or redecorate, your art will continue to work well for you — even if in a different room. Make certain that you use two picture hanging hooks for each item. This stabilizes your art and keeps the item level. *For tips on hanging artwork in groupings, see Making Arrangements. Some publishers (and galleries) provide comprehensive Certificates of Authentication with the art they sell. 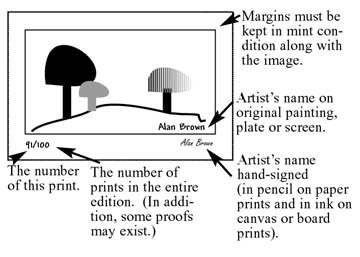 These authentications give information that may include the name of the artist, title of the work, year the editions were issued, the total edition size, the number of proofs, the name of the publisher and/or the printer, information about paper quality, dimensions, the individual print number, etc. Some publishers furnish “blank” certificates to galleries who are expected to fill them out themselves. With today’s printing technology, it certainly would be easy to duplicate a publisher’s certificate and /or alter the original information. So what good are these certificates? While they do provide worthwhile information, much of that can be obtained from the print itself and/or from the invoice. Without a doubt, a collector’s best safeguard is purchasing from a stable retail gallery - one with a solid history of reputability and with a retail location that you can visit. 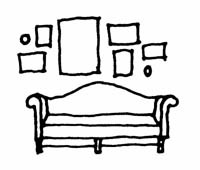 Gallery One’s suggestion: If furnished with paperwork relative to your art purchase, retain it. (You just might want to refer to it in the future!) You can make pertinent notes on the invoice - recording the print number, the correct spelling of the artist’s first name (if that does not appear on your invoice) and any other information that you might want to refer to in the future. Keep the original paperwork in your “files” and make a copy to store in an envelope stapled or taped to the back of your frame. Collectors often question us about print numbers - what they mean and how they relate to print values. To begin, let’s take you back to elementary school where you may have trimmed a raw potato to create a design. And then by gently placing the potato into some paint or ink, you created a potato stamp that could be applied to a piece of paper. Result: you made a limited edition work of art. As you can well imagine, the potato started to deteriorate after a few such stampings. Subsequent prints lost the clarity of the first few strikings. Today, nearly all of the limited editions that are produced can be “run” in editions of hundreds of thousands before any deterioration occurs. Therefore, the collector should be assured that all prints from a run are identical — even the proofs! During the process, the paper (or canvas) is printed on big presses and stacked to dry in numerous piles. The paper or canvas sheets are trimmed and packed for shipment to the publisher where they are curated, signed and numbered. As you can imagine, the various steps make it impossible to tell which prints were printed first. So why number at all? Think of the print number as a serial or registration number designed to keep everyone honest. If a print is numbered 152/1200, that is simply the 152nd one numbered. Also, keep in mind that the artist seldom does his own numbering. And that the most valuable limited editions are those in mint condition...regardless of the print number. Incidentally, etchings and woodblock prints are clearer and sharper at the “beginning of the run.” Usually such prints are numbered sequentially as they are produced and early strikings may be more desired than later strikings. In many cases, Gallery One is able to track current values of art purchased from Gallery One. For valuations to be valid, artwork should be removed from its framing and/or packaging and be personally inspected by a member of the Gallery One staff at the time of the valuation to determine that such work has remained in mint condition. There may be a fee imposed for such an inspection and/or for providing a written statement of current valuations. In lieu of such an inspection, Gallery One may provide (when available) the reasonable value of such artwork in mint condition based on current nationally advertised prices. Such values will be issued orally or by e-mail. To find a certified appraiser, or to determine if your appraiser is “certified,” contact your local art museum or www.appraisers.org. The popularity of art on canvas or board has opened the door to new adventures in custom framing for the collector. Your limited editions and originals on paper are framed, no doubt, with extensive matwork, glass — and a fairly simple moulding. For works of art on canvas or board, the “rules of framing” are very different. Seldom do canvas or board works require glazing (a fancy term for glass!). And although matwork on your paper art looks terrific, its real job is to keep the glass from touching the work that it protects. All your canvas art really needs is a frame and a system for protecting the back of the canvas from dust and/or puncture wounds. Most conservators agree that an acid-free backing of foam core or matboard will do the trick. Such is applied by screwing or stapling this protection to the stretcher bars. Air vents are recommended to allow for air circulation and thus, prevention of fungus development. This is usually accomplished by cutting off the corners of the backing board or by cutting one or more holes (2" square) so that air can pass through. As long as the backing board is not paper sealed to the frame, enough air will pass through the canvas for proper ventilation. With these suggestions in mind, you and your framer can now select a moulding or combination of mouldings from a wide variety of choices. Wide and super-wide mouldings that were shunned by your print framing professional often look great on a canvas. In fact, your framer may even recommend multiple frames with (or without) linen or wood liners plus enhancers and fillets (wood accents that look like mini frames) . . . all used on the same canvas. It’s fun! And it gives the collector a real chance to live it up with the advice and assistance of framing professionals. It is our belief that all custom framing workshops should be supervised by a Certified Picture Framer. The CPF designation is the framer’s mark of excellence, awarded by the Professional Picture Framers Association to framing professionals who have passed rigorous testing to determine that they are knowledgeable and experienced in conservation and design. Gallery One’s custom framing department has been supervised by a CPF since 1986. Additional staff members hold that certification as well. Incidentally, the examination for certification is intense and requires frequent recertification. Ask your picture framer for proof that he or she has “passed the test. You’ve purchased fabulous art and had it professionally framed by a Certified Picture Framer to conserve and enhance the work. Now, you take it to your home or office, hopefully to enjoy for a lifetime. HEAT — direct heat from fireplaces, space heaters, radiators, etc. LIGHT — florescent lighting, bright sunlight and “over-used” picture lighting. To minimize the above negative factors, the Gallery One staff suggests hanging your items away from direct heat sources, avoiding inappropriate lighting (and/or replacing regular glass with UV-filtering products) and using air conditioning along with humidifiers and dehumidifiers to balance your humidity to acceptable levels. Hanging artwork in groupings can create an exciting look for any room. The simplest grouping is a pair: two pieces of art, framed identically. They can be placed side by side or one over the other, in an even or uneven manner. Another simple grouping might be three or more pieces of art of varying sizes. Each piece must be framed in the style and color that works best for that individual item. It will look best if one work of art is quite large, while the companion pieces are of smaller sizes. For an easy way to set up a grouping wall in your home or office, spread your artwork over the floor in front of the wall area where it will hang. Rearrange the smaller items around the one or two larger pieces until the grouping has a look of harmony. Take care to have faces looking into the center of your arrangement. Watch for a rhythmic flow of colors, shapes and media. Imagine your items hung low over the furniture or trailing to the baseboard for a designer look. Take light switches, outlets and heat ducts into consideration. When the “floor arrangement” looks perfect, move each item to the wall in the same relative position. note: Some homeowners swear by the following method: Cut newspaper or kraft paper to size for each item. Work out the “floor” design using these templates. Hang the “paper” items on the wall using small pieces of removable tape. Make needed adjustments. Use a straight pin or pencil to mark the spots where hooks should be nailed. Then hang* and enjoy. Look at the back of the artwork. Quarter it off mentally. Pull wire tightly at the 1/4 and 3/4 distances across. 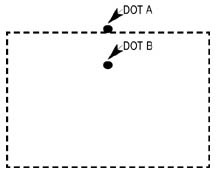 Then measure from top of the frame at point "A" to wire at point "B." 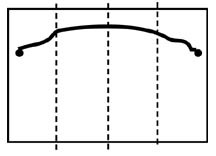 This measurement is called the "adjusted measurement." Hold artwork against wall in exact position where it will hang. Mark wall with pencil dot at top center of frame. 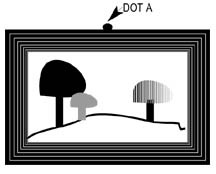 Remove artwork and make second dot at adjusted measurement. Measure half the width of the frame. 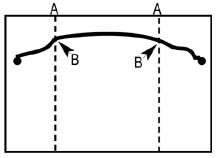 With a level, take this measurement and make two new marks equal distance from the adjusted measurement mark. These new marks are the hanging marks. Now nail each hanging hook just barely above each hanging mark.